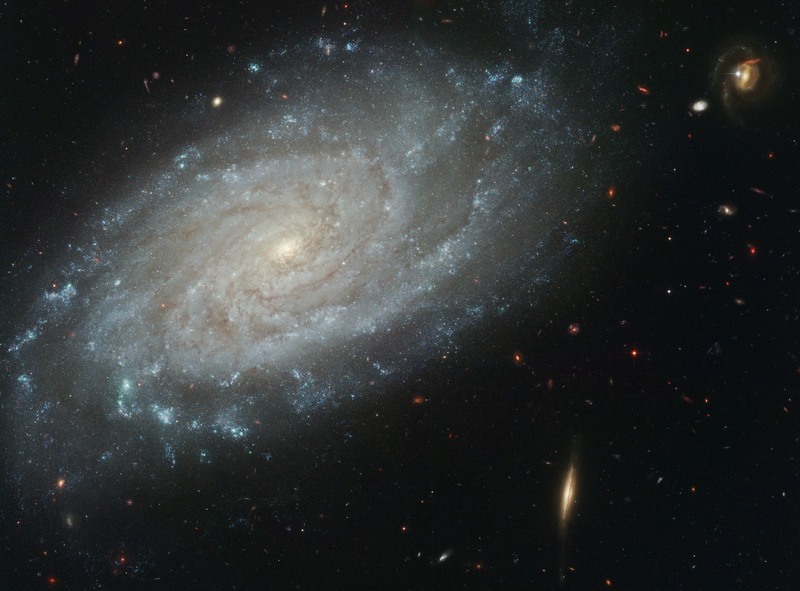 Located roughly 98 million light years away in the constellation Leo is this beautiful grand design spiral galaxy cataloged as NGC 3370 shown here in amazing HD thanks to the orbiting legend in the sky; the Hubble Space Telescope. This nearly face-on view of the galaxy shows beautiful vast, areas of star formation as well as the classical dust lanes that mirror the spiral arms. At its heart is the telltale yellow glow of older, ancient stars pooled to the center. In late 1994 this galaxy was popular for being one of the closest supernovae (SN 1994ae) in modern history. Type 1a supernovae are one of the most accurate ways astronomers measure distance in the universe and coupled with the fact that this image is detailed enough to actually spot and measure Cepheid Variable stars (another way distance in the universe is measured) leads to a very accurate measure of distance to this object. An interesting thought here; although we see supernovae all the time, they only appear in a galaxy once every hundred years or so. Of the possibly hundreds of background galaxies seen in this image, two really stand out. 48kb in the upper right corner is a galaxy much more distant than 3370 and it appears to be tidally interacting with its companion. Lower down on the right is a Sombrero Galaxy doppelganger cataloged as 45kb and it too is much more distant than 3370 but close enough to it to stand out in the photo. Don’t let that stop you though, if you’re on the blog, click and expand this photo and explore some details in the more distant galaxies. How big is it? : Roughly 100,000 light years in diameter. How far away is it? : Approximately 98 million light years (30 megaparsecs). Apparent magnitude: A pretty dim 12 or +12. Where is it? (General): Constellation Leo. Where is it? (Exact RA/Dec J2000): R.A. 10h 47m 04s.18 / Dec. +17° 16′ 22″.8. Image | This entry was posted in Astronomy (Learning), Astrophotography (DSOs), Galaxies, Images and tagged Astronomy, Astrophotography, DanSpace77, ESA, Galaxy, Hubble, NASA, NGC 3370, NGC3370, Science, Space, Space Telescope, Spiral Galaxy. Bookmark the permalink.